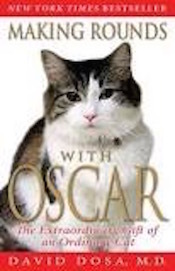 Making Rounds with Oscar: The Extraordinary Gift of an Ordinary Cat by David Dosa, M.D. Hyperion Books, New York. https://www.menupause.info/archives/18418 ) He was a most unusual cat and beloved by all the patrons. But the book Making Rounds with Oscar seems even more incredible, especially when his story is told by a doctor at the Steere House who was very skeptical of Oscar’s skills, until he started to interview people who had lost loved ones at the nursing home and also listened to Mary Miranda, the day shift nurse. According to Dr. Dosa, “Mary is the source of all knowledge on the unit, a central intelligent agent who knows not just the story of every patient, but of Steere House itself. ” (p. 3) I believe it was Mary who was key to convincing Dr. Dosa to investigate Oscar’s skills. Throughout the book, while Dr. Dosa is visiting patients and interviewing former patients’ families, the reader can see how devoted he is to his work. Dr. Dosa also discusses his own health problems and how he deals with those issues. His honesty and compassion are what make this book, to me, so special. Of course, Oscar is a special cat, as well, but without the book, only a few people would know about the wonderful service Oscar provides when he curls up with some one terminally ill. Actually, the family found Oscar’s “work” helpful to them, as well. I have always loved cats, and learning about Oscar has only increased that love. Dr. Dosa has written a wonderful book about his journey to disbelieving and then embracing what an extraordinary gift Oscar shares with patients and families at Steere House. As the back cover on my library copy states: A remarkable cat. A special gift. A life-changing journey. All true. The book is inspirational, especially is you are a cat lover! This entry was posted on Friday, June 10th, 2016 at 12:40 pm	and is filed under Reviews. You can follow any responses to this entry through the RSS 2.0 feed. You can skip to the end and leave a response. Pinging is currently not allowed.